Portugal offers a huge variety of landscapes; from the vast open rolling countryside of the Alentejo, to the terraced hillsides of the UNESCO Douro Valley, the granite hills that border Spain to the east and finally a seemingly never ending coastline. Explore the wide open landscapes, rolling hills, and cork trees in the Alentejo, or head North into the region known simply as “the Douro”. Amazing wines, breathtaking views and a paradise for foodies, this region has it all and then some. To experience the true diversity available in this small country, combine both regions and take in all the wonderful traits Portugal has to offer! There was Christine Tucker on a beach in Costa Rica. Surfing. Chilling. Minding her own business, really. When she got to chatting with a B&R guide, she thought, “That sounds like a good gig.” After 10 years spent guiding more than 40 B&R trips across the globe, it's turned out to be a little more than that. 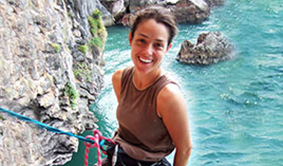 As one of our Trip Designers, Christine now combines her decade of experience with the same adventurous spirit that brought her to that fateful beach in the first place. Fill out the form below and one of our Portugal Experts will be in touch shortly.